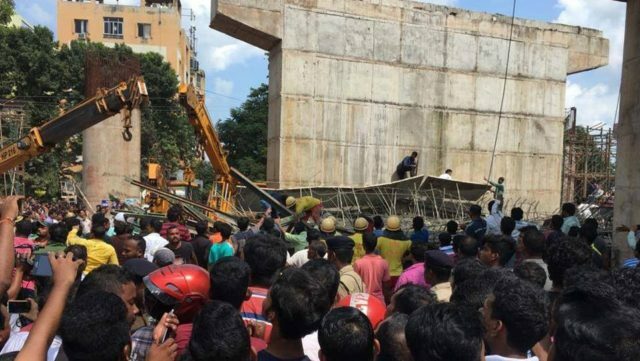 Bhubaneswar: A day after a portion of the under-construction Bomikhal flyover collapsed on Thursday night killing a labourer and injuring another, the Commissionerate police on Friday arrested owner of construction firm Panda Infra Projects Pratap Kishore Panda. “A case has been lodged in the Laxmisagar police station and Panda has been booked under Sections 304, 337, 338, 34 IPC. We would take up the matter seriously. We would bring those involved in the construction work under our purview of investigation. All those found guilty will be arrested,” said Police Commissioner YB Khurania. Later, Panda was referred to the SCB Medical College Hospital in Cuttack instead of being forwarded to court. Police sources said Panda after his arrest was sent for medical checkup to the Capital Hospital, where he produced his health reports and was referred to the SCB Hospital as he had recently been discharged after having undergone a major operation for kidney ailment and an abdominal stone surgery in a private hospital. A forensic team also conducted a probe at the spot in the afternoon to ascertain the reason behind the portion of the flyover collapsing, Roads and Buildings Chief Engineer Om Prakash Patel blamed the Panda Infra and the labourers for the mishap. Meanwhile, expressing deep grief over the death of a labourer, Chief Minister Naveen Patnaik on Friday announced an ex-gratia of Rs 5 lakh for the family of the deceased labourer. 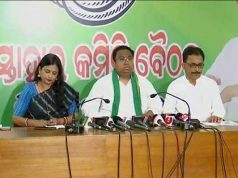 Patnaik said the medical expenses of the injured would be borne entirely by the State Government. The Chief Minister also ordered a high-level probe into the tragic incident. Notably, a portion of the Bomikhal Flyover collapsed when the iron railing installation work for a pillar was underway and at least 10 labourers were present at the site. A pile of iron rods fell on two labourers after a support for it collapsed.